Here’s a neat story I missed during Christmas, worth taking a look back at. A couple reasons why–one, it’s about an Arkansas Amish community–and you don’t hear too much about Amish in Arkansas, owing to the small size and remoteness of the Natural State Amish population. Two, it ties in with an issue we discussed earlier this week–challenges created by obstacles like busy roads running through Amish communities. It’s not a road jamming the Amish in this case. 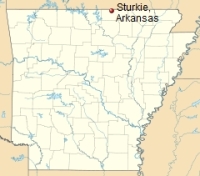 The Amish settlement at Sturkie, Arkansas (Fulton County), has been growing. And they’ve run into a little obstacle: a river. The South Fork cuts off access within the community, forcing Amish to travel 4-5 miles out of the way during high waters. The Sturkie Amish tracked down a scrap bridge and shipped it in from 300 miles away, then adapted and lengthened it to fit their crossing. Not exactly a piece of cake. “If we’d known what we were getting into, we may not have done it,” said one of the Amish involved. Read how they did it here. As an Amish community grows, it may bump into physical challenges that maybe weren’t so immediate when a new group first planted the flag. For another example, the Munfordville, Kentucky Amish settlement–one of the fastest-growing Amish communities in recent years–deals with something similar. A river bisects the community of 1,500+ people, necessitating out-of-the-way travel. Or at least it did when I visited summer 2010; perhaps they’ve done the same number as the Sturkie folks since then? This type of story is also a good reminder of the physical limitations you face when you rely on horse-drawn travel. If you aren’t using a car every day, spatially it’s just a different world. Distances become greater; life slows. Obstacles appear–otherwise easily avoidable, via a quick car detour. Your speediest routes–highways–effectively disappear (but are sometimes replaced by farm lane shortcuts invisible to the car driver). Take a ride sometime in a buggy and you sense it instantly. It feels agonizingly slow to reach the road just up ahead–the one you’d be whizzing by right now if you were behind the wheel. Traveling to a neighbor’s for church on Sunday morning, a home that seems just around the corner by car becomes a half-hour trek. And if you remember, a few miles down the road, that you left something at home, forget about whipping back to scoop it up. On the plus side, it’s a lot harder to overlook your turn. You probably won’t need to shell out for a GPS. And of course you get to smell the flowers (and other scents) along the way. I have the same problem when cruising the countryside on my Harley! Ugh…..
We have a trail systemin New Brunswick that used to be used heavily by ATV and snowmobile traffic, but that has dropped a lot recently dur to high gas prices. It was mostly old railroad right of ways, and even includes bridges. I think it would be possible to use it for buggy and horse traffic, which was one of the original intentions of the province maintaining the trail – it was supposed to be for non-motorized traffic, but then the province found it was a lot cheaper to let the snowmobile associations take it over. Our dogsledding neighbours use it frequently. No, the Amish in Munfordville have not constructed a bridge. Their “detour” is nineteen miles. They have divided the church districts with this in mind. Thank you Rich, and right back at you. When was school ever this much fun?